You are here: Home » RACE UPDATE: INITIATION BY FIRE! ilg’s ’18/19 Winter Racing Season begins with an OA PODIUM! RACE UPDATE: INITIATION BY FIRE! ilg’s ’18/19 Winter Racing Season begins with an OA PODIUM! Pic by Sandra Lee; Dewa helping her Daddy toward the Finish Line and a spot on the Overall Short Course Podium! Selfie; three hours post racing up and down over 4,ooo’ feet? racing like ilg did? feet up, watching ESPN; not THIS Daddy! BE WITH YOUR KIDS NO MATTER HOW HARD!!!! 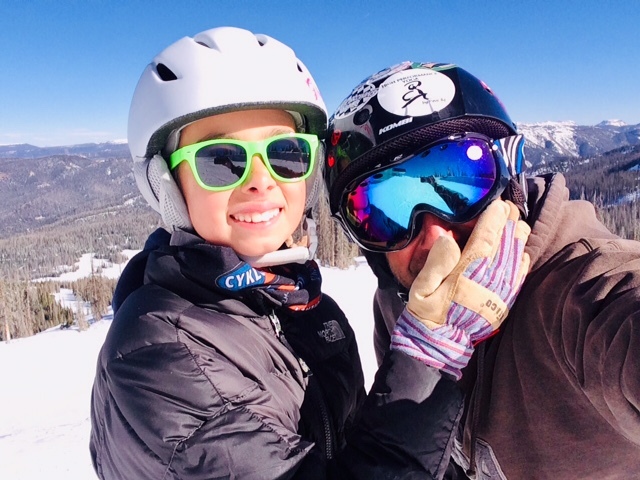 don’t know if y’all have raced/competed at ilg’s advanced age in the most demanding of all sports perhaps; Ski Mountaineering – while being a Conscious Single Daddy of perhaps our Plane(t)’s most extra-ordinary 11 year-old girl ever? thanks to my Winter Sponsor; ASEA ilg was able to secure a motel for Dewa, Sandra (my stalwart Partner since she was Dewa’s hired Babysitter when D was 4), and myself in ilg’s old h(om)etown of Pagosa Springs, CO located just 30-minutes fr(om) tomorrow’s race venue. we ate at Dewa’s favorite: Boss Hoggs (ilg had a Buffalo Steak to help channel the Strength and Widsd(om) of Buffalo for tomorrow)...we had an amazing mealtime, our bellies stuffed (First World Problem). s(om)ehow, ilg managed to stumble down to the waaay too cold swimming pool/hot tub to be with Dewa who jumped into the Arctic-like water and pleaded Her cases to have ilg join her. did not happen on this Race Night Eve! sorry, babe! Dewa is considering doing the Short Course! OMG! Throws a whole non-intended energy matrix into ilg’s Race Prep… much counseling and even practicing skin/ski transitions in the motel ro(om) in case she races; ilg goes to sleep fitfully after reading a SOUTHWEST GHOST STORY to D that puts Her to sleep immediately and ilg into a bardo realm of wondering how to get Her to race or not to race… very stressful in only the way a Single Daddy can understand in relation to introducing extreme outdoor sports to their child! Race Morning: up at 6a. Neti Shodhana? Check. Nadi Shodhana? Check. got the 6:30a hole shot for hot motel breakfast. Go(o)d thing WF Students are trained in adaptability instead of specificity; D and ilg totally enjoyed and Transmitted our hotel breakfast into Spiritual Energy. Om Ami Dewa Hrii!!! got both my girls packed and out the door by 7:04 which should earn ilg a podium spot already on the Daddyhood front!!! sadly, due to parenting responsibilities and intense Dharma talk about Dewa doing/not doing this race? Arrived at the Start Line with only 2-minutes to go; staged on the LAST LINE without ANY WARM UP!!! already? ilg’s feeble chances for a podium are eclipsed at the Start. (there are no ACCELERATIONS at our starting elevation of 10,300′ and goes up to and down again TWICE to 11,900′!). 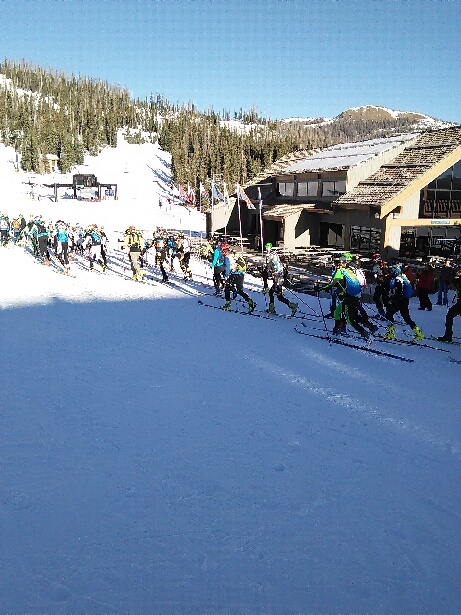 so, ilg starts skinning up the first climb of 1,000′ vert through a matrix of gro(om)med and powdery, unconsolidated single track in nearly last place. made up a few spots on the uphill. ilg’s transition off the climbing skins into downhill mode pays off and ilg slays several scalps… stoked.. transition #2; back onto the climbing skins to retrace our uphill route yet, we keep skinnin’ upward to over 11,803′ on the Continental Divide before our second ski descent into the EX graded (means, EXTREME GRADE…aka; if you fall? you die or get really, really messed up). ilg rips off my climbing skins and slithers toward the drop in of the Extreme Ski section (Montezuma Bowl; go ski it tomorrow!) of 400’vert; it’s a narrow couloir whipped by 20+ mph winds and the angle of the ski route down is like trying to ski down a nearly vertical ice rink… it’s that icy and that vertical. Those words fr(om) this Angel were a divine trigger to ilg’s soul as Pete slowly, gingerly etched his ski edges into the icy couloir’s skin finding sudden soft snow on a descent line that was opposite of ilg’s reckoning. ilg swallowed deep; maintained the Mantra, and started onto the ultra steep face. imagine a hockey rink. flip it nearly vertical. invoke rock cliff bands on either side. now? Ski It! transition into downhill mode for a super fast Rambo descent of a Black Diamond ski run (Most Difficult, which felt like a Green Circle – easiest) after ilg’s surviving of the other two previous descents. then? 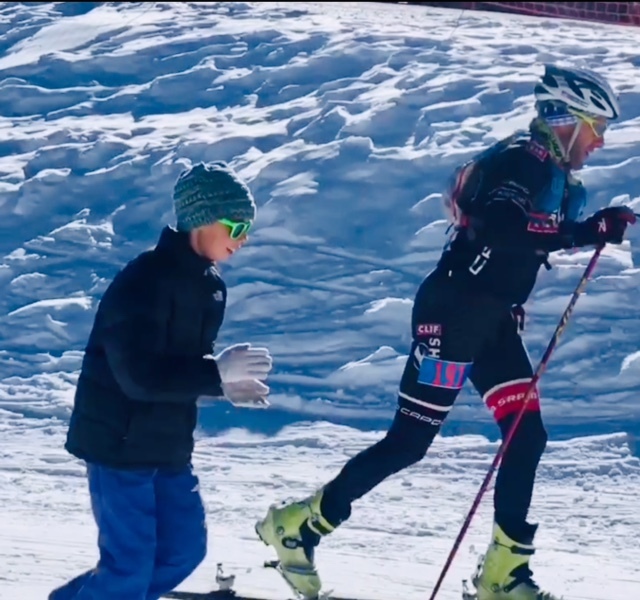 a final 800-meter climb out of the Meadows and back to the Ski Base Lodge Finish where ilg was met by Dewachen as pictured… she escorting ilg to the Finish Line? THANK YOUR FOR YOUR SUPPORT!! !